The editorial board of Volume 50 of the St. Mary’s Law Journal. For the past 50 years, the St. Mary’s Law Journal has been punching well above its weight class, becoming one of the most influential legal journals in the nation. The legal analysis written or edited by the more than 1,400 J.D. 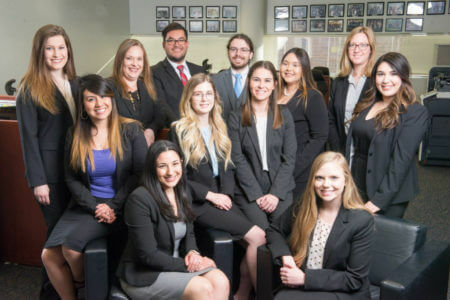 students who have dedicated their time to the Law Journal over the past five decades has influenced court decisions around the world. The Law Journal ranked in 2017 in the top 4 percent most-cited law review in federal and state courts nationally and the top 3 percent most-cited law review in courts worldwide. As the current editorial team works on Volume 50, current editor-in-chief Katherine Spiser Rios, a third-year J.D. student, feels the pressure and importance of the Law Journal’s tradition of excellence. Martin Beirne (J.D. 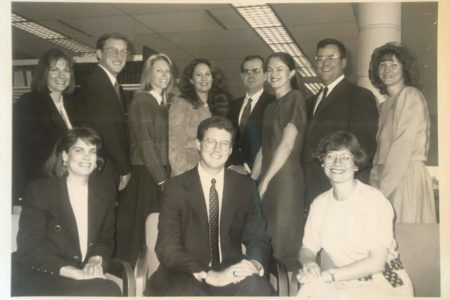 ’69), the Law Journal’s first editor-in-chief, realized how influential a law review could be while clerking for a law firm in downtown San Antonio. “I gained a deeper appreciation for law reviews. I had to do a lot of research, and I could see so many of the courts and lawyers relying on journals’ scholarship,” Beirne said. The editorial board of Volume 34 of the St. Mary’s Law Journal. That scholarship, Beirne noticed, was not only from other practicing lawyers, but also from students. He approached then-Dean Ernest A. Raba (B.A. ’34, LL.B. ’37) about the creation of a law journal, who then appointed an exploratory faculty committee to research the idea. 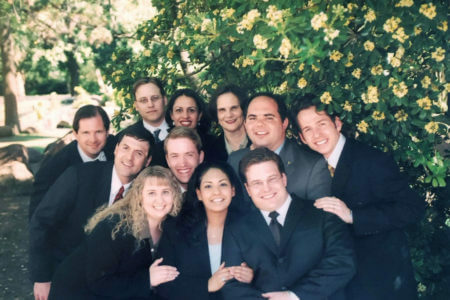 A year later, the faculty committee decided a law journal would be critical for the law school “to grow in stature and reputation.” Students formed a board and staff of writers, and Beirne became the editor of Volume 1. The students received a lot of support from the local community. Banks would take out ads in the Law Journal, while members of the legal community helped underwrite some of the first projects, Beirne said. Even more notably, the Law Journal received articles from Texas Supreme Court justices for publication in its early issues. Texas Supreme Court Justice Paul Green (J.D. ’77), a staff writer on Volume 8, remembers enjoying the writing process. “Being able to structure your legal writing — learning how to support your argument and weave your argument — that was really important,” Green said. As a judge, Green finds law reviews useful to determine how a particular legal issue has been handled historically, how it is viewed presently and how judges should look to interpret it in the future. The Law Journal has been cited in numerous state supreme courts, including Alaska, Colorado, Indiana, Minnesota, Montana, New Mexico, Tennessee and, of course, Texas. The editorial board of Volume 21 of the St. Mary’s Law Journal. Standards of Appellate Review in Civil Appeals, first published in Volume 21 (1990), is one of the Law Journal’s most cited articles. It has been updated five times since, with another update coming this year. The Law Journal has had a significant impact on the development of law related to attorney conduct and the ethical standards to which lawyers and judges are held, Johnson said. Given the Law Journal’s influence over the years, third-year J.D. student and current senior associate editor Michael Lichtmacher said it is a tremendous honor to be part of the Volume 50 staff.